Room SAKURA will be used for Reception in the evening of 3 November 2020 and used for Signing ceremony for Kyoto 2020 Commitment in the morning of 4 November 2020. Lunch and coffee will be served for participants in SAKURA every day during the Forum. 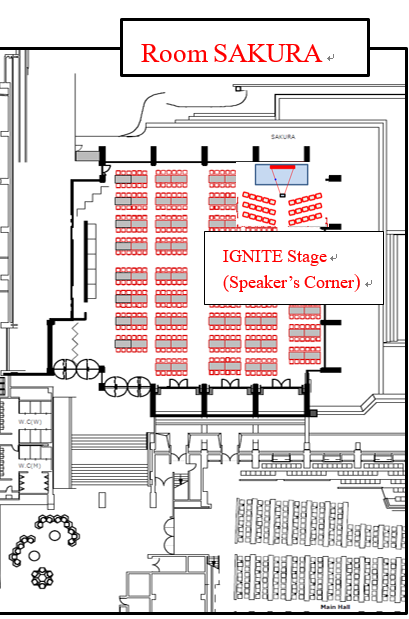 The IGNITE stage (speaker’s corner) will be prepared in a corner of SAKURA with a stage, screen and projector and 30 sheets. Participants are invited to talk to others in this corner. Those who will apply for the talk to the secretariat in advance have priority to occupy the stage in the proposed time. All participants are free to talk to other participants when the stage is available.